As we reach the last day of the first month of the year the temperatures have plummeted making a highly unpleasant day that produced a surprising amount of activity. The VCT completed their clearance of vegetation on behalf of a neighbour at Duffield and also took the opportunity to clear the remnants of a silver birch felled by recent high winds. The brash was transported north to a burning site where one spectacularly large fire was reported. Work continued on the extension of the EVRA shop the new Information Centre was wired in. The PWT achieved the changing of a further 16 sleepers in the area of Ken Rowlands crossing and the DTT cut the necessary two doorways into the toilet block and have largely completed the interior partitions. Deliveries of some of the internal components have been received at Wirksworth over the last couple of days as this project surges forward. The DST have been working on No3 and Henry Ellison as both these projects move forward to No3 being in service two months time and HE joining it in May. The Bubble Car project inched forward proving to be quite a major restoration and Mike the Flail made more impact between Idridgehay and Jebbs Lane bridge before the failure of an "O" ring terminated today's progress. The LMSCA continued with preparing the floor in 27001, the Brake Third Open and generously responded to an appeal to create two veneer panels for the Royal Saloon. We have had quite an international start to the week with a Steam Experience booking received from Kuala Lumpur yesterday and a visit from one of our Canadian shareholders, Mike Harrington, who whilst living near Calgary is presently working in Trinidad. He follows our activities via the wonders of the world wide web with some interest. You never know who's looking in! and the ballast bags have been filed similarly behind the weighbridge. The embankment garden again received treatment. on the new stove and declared themselves well satisfied with progress. A very quiet day with not many volunteers on site. A rare occurrence as we increase our enterprise. The Passenger Department dealt with the usual array of interesting phone calls and performed many routine admin tasks throughout the day. 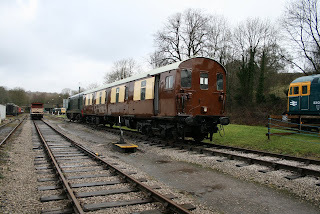 A small DMU team cleared out the front compartment of the Class 119 ready for the interior side panelling work to begin and they also installed a 'new' BIS so that the flow of electrons around the vehicle could become easier. Work continued on 55006, with more metal being added to the side after yesterdays repairs to the cant rail. And that seems to be about it. Yet another hectic day with our customer training his customer on the proper use of the machines before they enter service this weekend. Everyone declared the day a success and we hope to see them again before too long and my thanks go to Mick Thomas for facilitating their time with us. The PWT spent their time at Wirksworth discharging the garden quality sleepers to the car park for sale and the defective concrete ones to the trolleys north of Cemetery Lane bridge. The Works Train has been prepared for next week and loaded with some 300 base plates and 900 elastic spikes resulting in the need for much embrocation this evening. I have already taken mine but may manage another finger before the night is out. Much work on the EVRA shop redevelopment has taken place together with further work on the temporary steam shed. The Second Open has had its first coat of Umber undercoat and the Bubble Car south cab steelwork attended to. The dmu team also resolved flywheel repairs to 51505 and changed a drop light on 51188 and unusually finished in daylight hours. The VCT commenced work on a request from an insurance company investigating settlement on a house north of Duffield Tunnel that had been built on a clay base. The request to us was to clear all the vegetation our side of the boundary as this was deemed to be absorbing water contributing to the problem. We had a new lone worker today as John Silvester single handedly completed most of the studding up of the interior partitions of the new Duffield toilet block and reported that he was exhausted! Not bad for a dank and cold Thursday. The delight today was to welcome a mytesttrack customer who will also be with us tomorrow. They have been ably hosted by Mick Thomas for quite a long day and will welcome their customers to a demonstration tomorrow. This is the first "real" MTT customer we have had for some time and their visit coincided with another potential client who, if all goes well, will occupy us for most days in March. It is all very warming. The Second Open had its roof completed as it moves towards the Pullman image and work progressed on the enlargement of the EVRA shop following the acquisition of a separate Information Centre. The lone Carriage Cleaner was not alone today being joined by Eric as they gave the Santa set a deep clean. Will he return to this essential but largely unloved task to keep the lone Carriage Cleaner company? The DTT inserted the second door lintel in the new Duffield toilet block and much research was undertaken to source all the necessary fittings a minimal cost. Nonetheless, this project is likely to absorb some £5,000 and, even at this price, is a saving on hiring portaloos. The PWT were active at Shottle with four panels of the loop line secured with spikes or eclips as appropriate and fishplated up. The Booking Hall continued the good work of taking and making the arrangements for the increasing group bookings flowing in this year. A very nice and touching touch to our activities was a report from Paul that he had noticed the Heage Windmill volunteers were appealing for apple wood. In the VCT's felling activities two mature apple trees have been felled and, at the request of Heage, have been logged into 3ft lengths and transported to Hazelwood for collection tomorrow. The wood will be stored for some years and apparently, when ready, are used in the gearing of the windmill. Given the late lamented Colin Blower divided his time between us and the windmill it is a great association of his two loves. The last two days have seen encouraging support for the enterprise by our shareholders giving much needed lift to our immediate aspirations. We also spotted a group in a white transit van that seem to be taking a great interest in batteries. The registration number has been stored should there be any unplanned activity in this area. A day of extraordinary productivity and record consumption of tea. The Filing Fairy continued her never ending quest to ensure our paperwork is up to date partly caused by an ever increasing influx of new volunteer faces. This is the subject of much celebration as it means we continue to grow and be able to achieve an ever growing range of projects. The LMSCA gained an extra volunteer today as they tackled the renovation of M27001 and the VCT were in action with their continued attack on the lineside vegetation. The PWT were in solid action at Shottle with four panels of the proposed loop fitted with rails and a collection of concrete sleepers yielded from the trolleys isolated at Gorsey Bank spaced out ready to receive rail. The DST fielded a team of 10 and reported work on all three of our steam locomotives. The Bubble Car's southern cab windows were removed yesterday and remedial work on their surrounds was carried out today.In the south the DTT achieved one lintel of the two new doorways and made significant progress with the interior partitioning. Chris R assisted our Station Garage to get on line to enable us to book our vehicles in whilst active on the Railway. A start has been made on extending the EVRA shop area into the former Information Office and the Booking Hall nearly reached the end of our current mailout to shareholders as well as dealing with an ever increasing pace of enquiries about the upcoming season. Some of you may remember that back in November the Please Y'self Skiffle Band came to Wirksworth to film the video for their new single Dead or Alive. The video is now available on YouTube for all to see at http://www.youtube.com/watch?v=Xaoa9DEieAM . We've decided we really quite like it! rather to our surprise. Its owners duly came to collect it this evening. can only be resolved by the application of embrocation. A bitterly cold wind today with squally showers. Now the Michael Fish part of the report is out of the way, today was very much a day of maintenance. The Class 20 Locomotive Society fitted a new FV4 valve to their machine which ensures correct operation of the brakes! A small turnout of guys from the Pioneer Diesel Locomotive Group performed maintenance on the Class 33, with particular attention being paid to the coolant system. 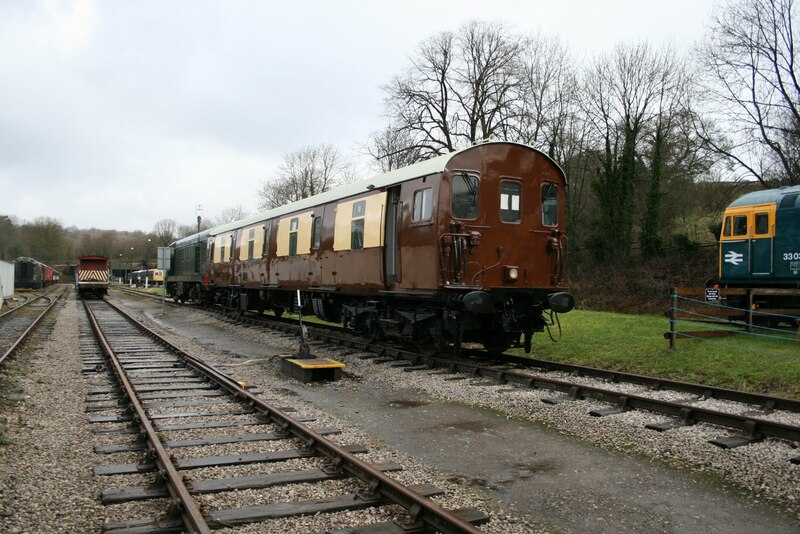 Both groups taking excellent steps to ensure the Diesel Locomotive Weekend in March goes ahead as planned. The DMU group moved 51505 to the pit to perform a major examination after a period of 7 months undergoing internal refurbishment. They were hoping to declare Phase 1 of the refurbishment which has included the ceiling, lighting, door backs and a return of First Class accommodation complete subject to a successful test run but unfortunately, with the day light fading, it was decided that this could not quite be reached yet as the mechanical examination was taking longer than usual due to the long period of standing. Maybe next week! Phase 2 will be performed in stages over the next few months which mainly concerns the reupholstering of the seats which are now looking tired. Work continued on the bodywork of the bubble car. Progress today included returning the internal guard van panelling to the walls covering over the new metalwork. Some wire brushing was done on the metalwork exposed by the removal of the dome. The 8F group were corking the boiler of Henry Ellison. The LMSCA were in attendance working on the flooring of the LMS Brake Third coach. The Passenger Department, after completing the induction of a new university student who is doing voluntary experience work in the Booking Hall with us, met with members of other departments to discuss how the recent Santa Specials had gone and to decide on some improvements that could be made. The day started somewhat strangely as, apart from a lone VCT member joined by a lone PW member, the tumbleweed was blowing gently across the platforms and I felt I would have to report on the lowest productivity ever! However, as the day passed by it was clear that the usual scale of endeavour was in progress at various locations along the line. A major event was day one of the DTT who commenced the interior partitioning of the former Vodaphone building setting this project underway. The former Gatwick Express Second Open received most of the splendid white roof that it will sport in its new guise with that part of the project due for completion tomorrow. The dmu team made further progress with the interior of 51505 and the new first class carpet looks really good. The "Bubble Car" had further work in what has become quite a major refurbishment that will deliver an excellent end product for us. The PWT had decamped to Shottle preparing three panels for the loop and burning yet more life expired sleepers. The VCT did spring into action achieving their normal clearance of the lineside south of Old Lane bridge. Castings that have been made from patterns provided from No3 are now made allowing No 3's originals to return to base. It is thought that metal pouring may take place next week to move Henry Ellison forward. I have to say we are grateful to Bob Gibbens for facilitating all this involving some 100 miles round trip to deliver and collect the parts at his own expense! Work also started on the project to reconfigure the interior of the Pullman Buffet Car and we will receive further advice tomorrow from the local authority to ensure our plans fit in with their aspirations. Not a bad day again. PS - All the activities reported recently are having quite an impact on our meagre finances and I attach another plea to our loyal shareholders to help us move forward. If you are not a shareholder I would urge you consider whether you can help and if this is quite an ask perhaps consideration of the Share Save scheme may be possible and relatively painless. All the necessary forms are available on our web site. Another rather dizzy day with Amey bringing in a SRS mobile platform to assess Duffield Tunnel and the Duffield footbridge all ably hosted by Tom Tait on our behalf. Also Network Rail's contractors were rather unexpectedly continuing vegetation clearance around the only road underbridge we have at the Sewage Works to facilitate ongoing bridge inspections. All this activity is most welcome as we develop our own structure management plan with the help of today's players. The PWT had to work around the bridge activities but managed to deliver many components for the Duffield toilet project and deal with sleepers for the Shottle loop and associated fittings. A further burn of life expired sleepers was a feature of the day together with a delivery of logs to Shottle for sale. They also transported the portaloo located at Idridgehay for Santa to Duffield which is not the most popular of jobs. Weather conditions inhibited the painting of the former Gatwick Express second open but all the doors have been prepared for their new colour of umber. The lone carriage cleaner concentrated on the condition of some of our catering fan heaters and air circulators and the Filing Fairy was very active in our record keeping demands. The Booking Hall processed three group and party bookings as prospects fro the year ahead look most encouraging. PS A pleasant phone call from Alex who has played a part in the PWT for a few years and now resides in Sussex to confirm he has passed his NVQ in permanent way work which reflects great credit on him and his various EVR tutors. A bitterly cold day with a hard frost at the beginning and end. Nonetheless, a day not without its dramas as organised chaos started the morning with a customer trolley testing, Network Rail's contractors descending to cleanse a number of our structures of vegetation and the PWT panting to attack a number of projects. 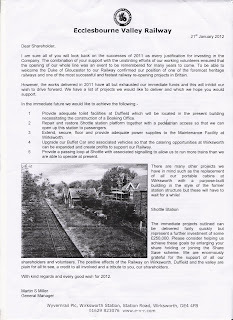 In the end the customer needed to go no further than the bridge guard rail on the truncated Gorsey Bank line and the contractors divided into two teams that attacked the structures between Wirksworth and Ravenstor and between Jebbs Lane and Wirksworth. The senior VCT returned to Old Lane bridge and reported a three fire day. After deciding how the day would shape up Mike the Flail set off for Duffield and dealt with the Up side between the A6 bridge and Duffield station together with the stretch between Duffield tunnel and the footbridge. The machine then decided to sulk and was off tracked at Hazelwood. The DST tackled No3 refitting its safety valves and continued to progress Henry Ellison which is now a "rolling chassis". They also report that the replacement components for Henry Ellison ,following the theft last year, have been cast and are ready for collection. A very irritating and unfunded expenditure for this locomotive. The PWT changed the remaining rail on the former Gorsey Bank line and then turned their attention to the pointwork north of the former dust dock which will be replaced by plain line. Many deliveries for the DTT (Duffield Toilet Team) arrived through the day, toilet timber and lintels from Tansley and door from Sheffield to be shipped to Duffield tomorrow. Much satisfactory action on the Bubble Car with the Guards door refitted and the southern dome removed for remedial work. The LMSCA have turned their attention to the Brake Third Open 27001 and fitting of steam pipes is in progress together with floor repairs. The Booking Hall is assembling our latest mailout to shareholders that we earnestly hope will pay for all the activity we have set in train to further lift our enterprise. the first class end will no doubt be pristine. Another freezing but beautiful day in Wasserville. Most of the work was down the yard today with the 8F group corking the tubes of Henry Ellisons boiler and the LMSCA doing preparatory work on the Brake Third. Much DMU work was carried out with small teams working on different vehicles. Routine maintenance was carried out on the 2-car and 3-car sets. Further work was carried out on the bubble car in the quest to renew problems with the bodywork. On top of this, a small team also started to construct the first class seats and install them on top of the new carpet in 51505, with this task proving much more difficult that it sounds. Work was also done to remove annoying leaves from around the Wash Green point work to allow them to operate better. No Friday 13th bad luck during today, with forward progress being made in the glorious sunshine. A few volunteers were on site progressing the various projects that are on going at the moment. Firstly, a useful standard gauge sized gadget was produced which, when laid on top of 'new' sleepers, gives the positions of where to drill all of the necessary holes to attach the rail chairs making it much easier to lay sleepers. Down the yard, preparation work continued on the Mk2f TSO ready for it to receive a first pass of paint next week. Next door work continued on the bubble car with new wood being fitted to the side of the guards door so that the door hangs correctly. The refurbishment of 51505 also progressed a step closer to completion after a new first class carpet was laid - very nice it looks too. The booking hall dealt with another couple of group and charter enquiries for later in the season. This seems to have come alive this week! The key project today was the removal of the defective water pump from L J Breeze, a task that has involved many technically proficient people, and the solution was declared to be outside our own resources. Happily, the LH Group and Hunslet have agreed to undertake the necessary repairs and Graham is delivering the offending item to Barton-under-Needwood tomorrow. The small PWT were unable to achieve much today but have reorganised the Yard and prepared the Works Train for its planned excursion next Wednesday. Much progress has been made with the former Gatwick Express second open with the roof prepared for repainting. In the adjacent bay the Bubble Car also saw significant progress with the timber work around the Guards door. The BCT (Buffet Car Team) benefited from John's CAD drawing allowing the position of the new facilities to be marked on the floor. The VCT, consisting of four members, returned to the south of Old Lane Bridge and achieved a splendid 4 fires to burn the brash opening up yet more views of our Railway. The Filing Fairy has been amongst us and further regimentation of our volunteer records has taken place. This is quite an achievement with a staggering some 200 active members. Husband of FF, newly designated as Structure Manager, has presented the final draft of our Structure Management Plan which will be a key part of our Safety Management System and allow meaningful discussion with Network Rail. There has been activity to prepare the timber to replace the exterior wood fire damaged on the brakevan that houses the display of lamps and the temporary steam locomotive shed has reached its final stage. Another day of dedication with the lone Carriage Cleaner tackling the interior of the Buffet Car. A great deal of dust and muck had resulted from the major exterior renovation and it is pleasing to report that the interior is clean again.The area which will be occupied by the new counter location has been cleared and washed down ready for the next part of the plot. The PWT worked in the area of Ken Rowlands crossing replacing a further nine life expired sleepers whilst their second team shipped some 6 or 7 tonnes of scrap rail to help raise funds. The scrap skip at Shottle is also loaded with "good quality" scrap that will help pay for further PW supplies. John Allsop has made significant progress with the standard class Gatwick Express coach as it moves to its new Pullman livery. A lot less remedial work is needed to this vehicle but I tend to forget how much area there is to prepare. The Head of Gardening made further progress with the Wirksworth station garden inhibited by the actions of selfish dog owners. A shock tactic may be necessary to eliminate this problem. What voltage shall we use? The Booking Hall took three group bookings for the year ahead which is tremendously encouraging as work behind the scenes to raise our profile on Google by quite sophisticated means appears to be paying dividends. A design of a new Pullman based catering and group booking leaflet is also taking shape which will capitalise on our offers in 2012. It is almost a pleasant to get back to a period of productivity after weeks of lethargy as Colonel Stephens would say. The PWT, without the benefit of a locomotive, departed south by Landrover to collect the necessary equipment to return to the Ken Rowlands crossing area and replaced 14 defective sleepers. This activity affected the productivity of the VCT but they managed significant progress at Old Lane Bridge that will leave any unsuspecting road user that there is a vibrant railway there. The DST reported that Henry Ellison's vacuum pipes and lubricator pipes have been fitted, Cathryn has seen further parts removed for examination and No 3 has had it boiler caulked enabling it to be put together again for the 2012 season. I was delighted to welcome a customer who had been developing radar detection with us for use in Australia and to learn that the product is now under production in Derby. They visited to trial some rail flaw detection equipment which proved successful. One member of their team is resident in Perth, Australia and will return there tomorrow demonstrating that we are truly world wide. Fred and Iris gave the Mess Hall a very good do and we had the first meeting of the BCT (Buffet Car Team) that will reconfigure the interior of the Buffet Car to meet the challenge of increased sales in 2012. The Bubble Car had timber prepared for the interior of the guards compartment and the LMSCA continued their sad task of removing material from the Third Open. Another spectacular day with a shunt involving a great deal of our rolling stock to place the new Pullman Buffet Car in the bay platform and arrange for the former Gatwick Express First Open to enter the Maintenance Facility. This took up the whole day for Hylton, Mike Evans and Bob Green who deserve great credit for performing the delicate manovres with skill. Amongst their tasks was the positioning of The Duke and adjacent Plate wagon for the lifting of its water tank on Monday. The reward was to see the Buffet Car in all its glory back in the bay platform ready for internal modifications necessary for the 2012 season. A two man PWT visited our supplier of track components, the one left after the rest had relocated to Mexico, and collected sufficient material to complete the "jointing" of the former long welded track. They then went on to stow these parts in the Tool Van at Shottle for use over the next few weeks. The dmu team were out in force to replace a broken drop light in Iris with a replacement from stock. Not a straight forward task but successfully achieved. The Down side drivers door lock was refurbished on E50599 to ensure there on no further problems with its secure closure. The station at North Pole has returned to its normal guise as Idridgehay and we just have the task of returning the Portaloo to Wirksworth to restore the station to its normal status. The VCT managed a five strong team and examined the track between Idridgehay and Duffield to ensure the line was unobstructed. It has to said that their work over the years has ensured we had no problems and, having had a look at the national network site where falling trees had affected many routes, they have ensured we remain safe from this sort of problem. They managed further clearance south of Old Lane Bridge, a routine check and clearance of the culvert just north of the bridge and had a warming two fires. The Bubble Car renovation proceeds apace with major renewal around the Down side guards door. Another very good day and I attach a photo of the new vista on Platform 2. The great success of today was choreographed by our Dear Leader of the PWT making maximum use of the locomotive available to him. Some 70 sleepers were dropped off to be exchanged for life expired versions between Gorsey Bank and Idridgehay, scrap was recovered from various locations for conversion into cash, life expired sleepers were added to the great sleeper resting place south of Hazelwood and the de luxe S&T van was positioned outside the planned toilet facility at Duffield. "Smalls" and garden quality sleepers were loaded for transport to Wirksworth, a lone concrete sleeper recovered from Postern Lodge and more defective ones from Shottle North Junction. All this together with a load of logs delivered to Shottle for sale and the collection of chairs and baseplates accumulated by the VCT at Hazelwood represents a tremendous achievement for the team. Back at base the lone Carriage Cleaner, aided by son and heir, stripped the Santa train of decorations and gave the three car set a good clean. Son and heir then went onto achieve more work fencing the picnic area. The Filing Fairy was also in attendance pursuing the ever necessary updating and adding to our records. Husband of Filing Fairy presented the first draft of a Structure Management Plan as we prepare for the transition from Network Rail, whenever that may come. There was progress on the temporary steam shed and the Booking Hall responded to demands for statistics and preparation for the first of our 2012 galas. A surprising and short conversation took place with our supplier of track components. In response to "where are you" the reply was "Mexico" - no wonder prices have risen through 2011! I was also introduced into a little know fact - the expiry date of all crisp packets is a Saturday. Look in your cupboard and see if this is true! The New Year has returned with a vengeance today which started off with torrential rain mellowing to sunshine and showers. 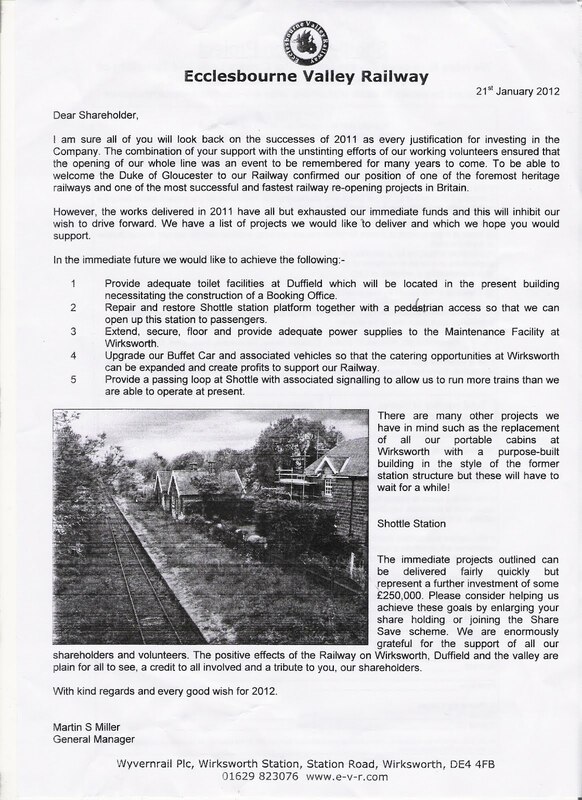 A five man VCT turned their attention to an area south of Old Lane Bridge between Idridgehay and Shottle opening up more views of the Railway from the main Duffield to Wirksworth road. A large fire, as ever, consumed the brash from this exercise. A rewarding piece of news was that the Buffet Car is now complete from its exterior renovation and is ready to be moved from the Maintenance Facility back to its normal location in the bay platform which we hope to achieve on Thursday. Two of our large diesel locomotives featured during the day with the Class 20 being run up after some weeks of inactivity and achieving a little light shunting. The Class 33 team were also in attendance to progress the electric train heating generator which will provide a very useful feature for us as both the Royal Saloon and the former Gatwick Express coaches can use this feature. The LMSCA continued their clean up and the DST claimed a success with their pressure testing of No3's boiler. The DTT (Duffield Toilet Team) had a very useful site visit to finally determine what can be fitted into the former Vodaphone building and physical work should start on this vital project in the near future. The PWT completed the rail changes on the former Gorsey Bank line. The object of all the activity on this line was to put second, or third, hand rail on what has become a siding to release good rail for use at Shottle. The train for tomorrow's long list of jobs was assembled. The Booking Hall had an accountancy and general tidy up day. Quite an achievement by all concerned in very unpleasant conditions. Somewhat of a damp start to the New Year, but occasional sunny moments. the progress of that restoration work. proportion than one might have found on a normal operating day.